Theatre64 joined forces with the RSC as part of their Open Stages Project! Gill Richardson directed an ensemble cast in 'Much Ado About Nothing' in October 2014 which was also be performed at the Nuffield Theatre in Southampton. With training, advice and support from RSC professionals we learned so much and it was a fantastic show! After 52 years we have had to make the difficult decision to close the group. We all have a lot of other commitments now and are regretfully not able to give the time needed to put on a show. A big thank you to everyone - members, friends and family - who have been involved in our productions, in whatever capacity, over the many years the group has been running. Thank you also to our audiences who made it all worthwhile. Do continue to support local drama, there are a lot of fantastic groups in the area. I'd like to personally thank all of the cast and crew from the years I've been here for the great memories and some shows we can be really proud of. Do keep in touch. One of William Shakespeare's best-loved comedies; Hero and Claudio, soon to wed, conspire to get verbal sparring partners and confirmed singles Benedick and Beatrice to the altar against their better judgement. Massive congratulations to the amazingly talented cast. Brilliant show, worthy of the west end! You should be very proud. Wonderful acting, singing and those fab harmonies! Theatre64 have been selected to join forces with the RSC as part of their Open Stages Project! 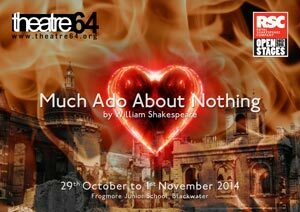 Gill Richardson is directing an ensemble cast in 'Much Ado About Nothing' in October 2014 which will also be performed at the Nuffield Theatre in Southampton. 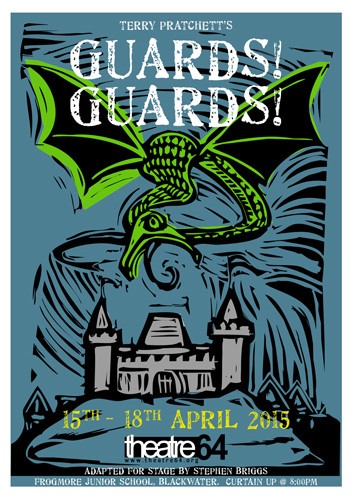 With advice and support from RSC professionals it's sure to be a fantastic show! Ankh Morpork's only line of defence in the face of a 60 foot dragon is the City Night Watch - a sorry bunch of has-beens, led by Captain Sam Vimes (a drunk), along with the overweight, cowardly Sergeant Colon, Corporal Nobby Nobbs (technically a man but disqualified from the human race for pushing) and their newest recruit - Carrot Ironfoundersson, technically a dwarf but over 6 foot tall! With the help of the Librarian, an Orangutan (don't ask! ), Errol the swamp dragon and a cast of thousands, will they be successful in their fight for truth, justice and the Ankh-Morporkian way? 'Terry Pratchett' and 'Discworld' are registered trademarks. Two men meet in no man's land in the middle of battle. They wear different uniforms... enemies. But they do not try to kill each other immediately. Slowly they begin to talk and an enemy turns into something different, something more human. This play poses the question; when does an enemy become a person? What sort of individual can still pull the trigger when the uniform in front of them has a story, a face or a personality? Engaging characters, timeless poetry and familiar songs pull the audience into the trenches where simple human conflict mirrors the terrible events unseen. 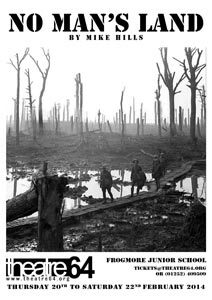 A poignant drama about a pointless method of warfare. Accessible, poignant and, at its core, engaging - go see it!